Always attention to detail, technical skills, passion in our work and great attention to customer needs are the strengths that have allowed us to excel in the field of sale of Airbrush Evolution AL PLUS 0.20 Harder & Steenbeck in aluminium. Consultando il catalogo di Aerografando you will immediately notice how vast it is and how diversified the model range is Evolution, you will find the best Airbrush Evolution AL PLUS 0.20 Harder & Steenbeck in aluminium offers at the best prices on all Airbrush Evolution AL PLUS 0.20 Harder & Steenbeck in aluminium of the brands Harder & Steenbeck. Harder & Steenbeck adds a whole new meaning to the term "air brush": The brand new Evolution ALplus is Harder & Steenbeck's first airbrush made from aluminium, giving it an almost airy weight of only 56 g, just about half as much as a traditional airbrush. And its design is striking as well, with a stylish matte black finish accentuated by chromed open needle cap, cup, lever and centre ring. The Evolution ALplus is available as a solo model with 0.2 mm fine line nozzle set and 2 ml flow cup and as a 2-in-1 version with an additional 0.4 mm nozzle set and 5 ml flow cup. Other than that, the ALplus has all of the Evolution CRplus models' tried and tested ergonomics, features and functionalities. Read the reviews of our customers on Airbrush Evolution AL PLUS 0.20 Harder & Steenbeck in aluminium of the category Evolution. With us you will find only satisfied customers, thanks to a technical assistance made by those who really know the world Evolution. Review Airbrush Evolution AL PLUS 0.20 Harder & Steenbeck in aluminium of the brand Harder & Steenbeck. 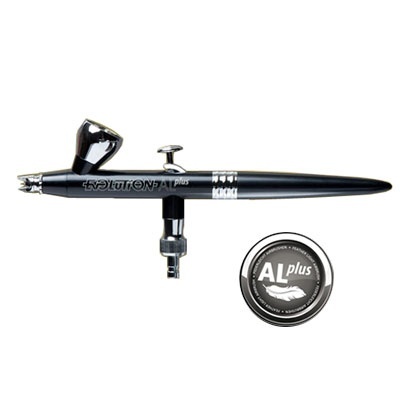 Trust in the quality and professionalism of Aerografando on the sale of Airbrush Evolution AL PLUS 0.20 Harder & Steenbeck in aluminium, only from us you will find the best prices. You want to have more details on Airbrush Evolution AL PLUS 0.20 Harder & Steenbeck in aluminium 126255 or more generally on ours Evolution? You are looking for a Evolution but do not you find it in the catalog? Staff of Aerografando will answer all your requests.